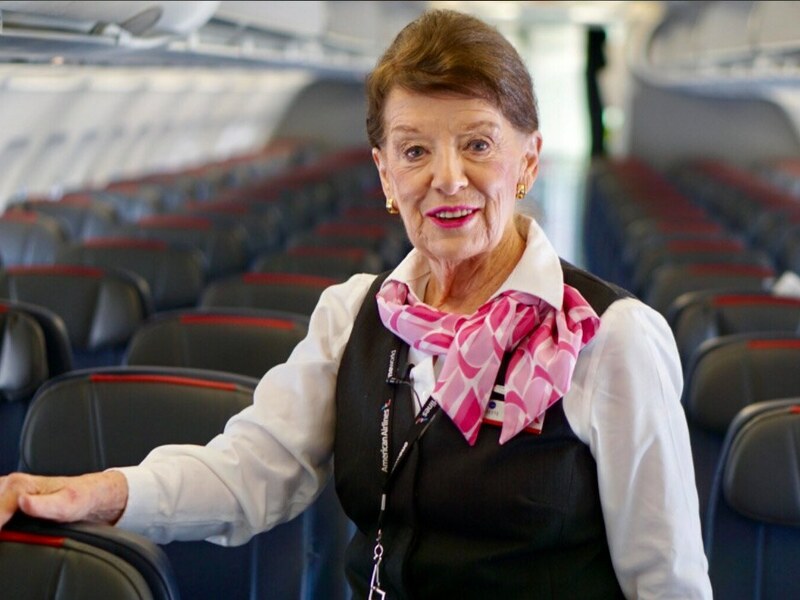 Bette Nash, now 82, has been an American Airlines fight attendant since 1957. When Bette Nash started her career as a flight attendant, Dwight D. Eisenhower was president and I Love Lucy was airing its final episodes. Airplane meals consisted of lobster and carved meats, and tickets cost somewhere around $12 and required no reservation. And while the times (and aviation industry) have certainly changed, Nash’s job title has not: At nearly 82 years old, she just celebrated 60 years of service with American Airlines, making her the company’s most senior flight attendant. Nash’s love for flying began in her late teens, when she took her first flight from the Washington, D.C.-area Reagan National Airport (DCA) to Ohio. Then in 1957, at age 21, she began her career with Eastern Airlines, whose routes switched over to American Airlines in 1989. Unsurprisingly, the requirements for being a flight attendant in the 1950s were a bit different than they are today. Of course, there were shinier aspects to the so-called Golden Age of travel, as well: Nash recalled the days of fine in-flight dining and passengers wearing suits and pillbox hats. She even got to serve the Kennedys when they were en route to Boston. For almost her entire career, Nash has flown the shuttle from DCA to Boston and then back to DCA, so she could be back to her Manassas, Virginia home by night to be with her son. Millions of miles later, as the airline’s most senior flight attendant, she can choose to fly whichever route she wants, and she still flies that same shuttle several times a week. But the job has always been more about the customers than the destination for Nash—and the customers definitely notice. The feeling of appreciation is mutual. On November 3, American Airlines threw Nash a diamond jubilee celebration at Reagan National Airport, the very airport in which she first decided to become a flight attendant. A crowd gathered to see CEO Doug Parker announce a $10,000 donation to Sacred Heart Catholic Church Food Bank in her name (Nash regularly volunteers and donates there). In addition, American Airlines Vice-President Jill Surdek presented Nash with diamond earrings from Tiffany’s.